Your sales meeting should be almost sacred ground. You’re there for an honorable purpose: to improve the knowledge and skills of your sales team. And, therefore some things just aren’t welcome. It’s absolutely acceptable to publish a brief sales meeting rules and regulations outlining what you expect. You can make it fun, but get your point across as seen in the following example. Don’t let negativity take root at all in your meeting. You must snuff it out at the first sign. Now, this isn’t saying you need to stick your head in the sand and ignore real issues, but there is a time and place for everything. And your sales meeting is not the time to crank up every complaint in the book. A manager was conducting a sales meeting several years ago when a group of the salespeople thought they would basically ambushed the manager with concerns about their commission program. It was obvious later that it was an orchestrated event by a couple of disgruntled employees who unfortunately talked a few others into falling on their swords as well. As the manager always did, the manager invited them to talk offline privately because the item wasn’t on the agenda and the manger wanted to respect the time of the other 30-plus people. The manger wasn’t trying to ignore them or put them off, the manager just didn’t believe that meeting was the time or place to talk about their personal issues with compensation. A couple of them disagreed and it quickly derailed into raised voices and an emotional outburst by one young lady who shouted at the manager and started to walk toward the door. As the manager was telling her, “Don’t walk out of this meeting! Don’t walk out of this meeting,” she walked out of the meeting. Bad move. The manager went to work Monday morning. She didn’t. The moral of the story is the manager lost control of the meeting and, it got ugly. Once it did there was no way to bring it back. You can’t un-hear or un-see some things. It should’ve never gotten that far in the first place. The manager did a poor job of handling it and ultimately it ruined the meeting, wasted a lot of people’s time, and cost one person her job. And, it didn’t have to happen. 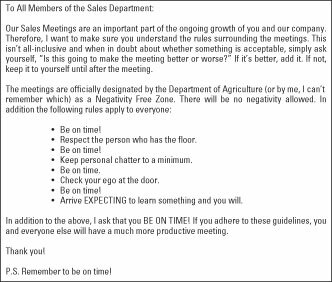 If the manager had done a better job at laying out the meeting ground rules: If you have a personal issue, we’ll talk about it personally. Don’t use the meeting for grandstanding or showing off because it’s not going to go well for you. Now, does this mean you cannot talk about problems during the meeting? Absolutely not! In fact, you should address issues, but keep the conversation positive. You will have certain salespeople who are problem finders. They seem to thrive on pointing out what’s wrong, what others have messed up, and what isn’t working. Oddly, these people never have a solution, just a problem. This is the type conversation to avoid. However, if you have an issue that you and your team can discuss in a positive, professional manner and work through potential solutions, it most certainly has a place in your meeting. One of the ways to head off efforts to go negative is to require people to have a potential solution when they bring a problem to the floor. This will stop a lot of those who simply look for things to complain about. They generally don’t want to do that much work to look at the positive, they just want to b . . . well, you know. Just as you ask your salespeople to be positive, make sure you do the same. Your sales meeting isn’t the time to criticize or call someone out for something she did or did not do. There’s nothing to be gained by it — in fact, many times it makes you look small because the rest of the sales team will sympathize with the criticized person. If you have sales results to announce or display, you don’t need to hide anything, even if numbers are down. You can still focus on the positive. You’ll never build a strong salesperson by tearing her down in front of others. Contrary to what some may believe, that doesn’t build character. It makes you look like a very unprofessional manager. Praise publicly; criticize privately. If you need to discuss someone’s shortfalls and areas she needs to improve upon, do that alone when it’s just the two of you in your office. Don’t do it in front of the entire group. If you really want to create a strong team, find something good to say about everyone. You don’t have to go down the list like you’re Santa Claus reading off every little good boy and girl. But, make it a point to build people up and realize that the best place to do that is among their peers. Amazingly, when you find something to compliment people for and brag on, you get more of that behavior naturally. For example, if you really have to stretch to recognize Bob for his prospecting skills, Bob will become better at prospecting. If he thinks that’s your perception of him, nine times out of ten, he’ll live up to that. By the same token, if you criticize Bob because he failed to make the required number of calls, he’ll repeat that behavior as well — or he’ll quit. Your job is to build a better, stronger, more talented sales team. One way to do that is through positive, public feedback and guidance.